The Wall Mount Single Pocket Tri-fold Brochure Holder with Business Card Holder is ideal for business cards, gift cards or coupon cards in addition to your brochure. 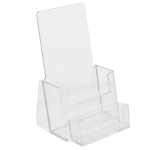 This holder is for material up to 4 1/2” wide and can be adapted to stand on a counter or table top with our Angle Bracket (AB1). 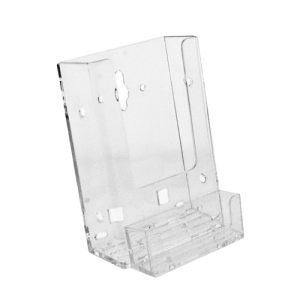 Exclusive attachments include our Slat Wall Clip, Wire Grid / Grid Wire Adapter, Suction Cup, Peg Board Adapter, Angle Bracket, Couple Me Clip, Add-a-Pocket Clip, and Rack Adapter Clip. 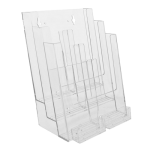 The Wall Mount Single Pocket Tri-fold Brochure Holder with Business Card Holder is perfect for your tri-fold brochures with business cards, gift cards or coupon cards conveniently attached to the front of the brochure holder.